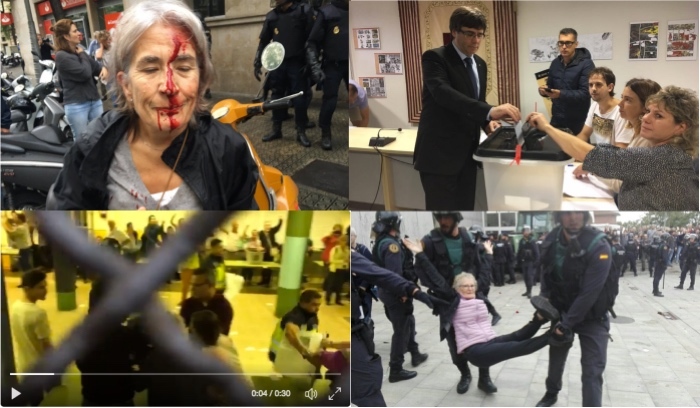 As expected, our establishment/propaganda media hid the brutal crackdown by Spanish police on peaceful voters trying to exercise their Democratic right to vote. Are they afraid of showing people what govt actually thinks of their serfs? Are they afraid people will figure out that we might have the same problems, and that they are all rooted in bloated govt and career politicians? Why in God’s name is Trump, America’s anti-establishment representative, showing any support for Rajoy? These are very disturbing images and videos coming out of what is supposed to be a modern Democratic country. The reality being exposed in Barcelona and all across the Catalan region of Spain, which is larger than Portugal, is that there is a very fine line between the mindset of real dictators and many leaders in the West who feel their perks and power are at risk. Fortunately, the collapsing trend of Socialism/Marxism cannot be altered, for who likes less freedom and fewer job opportunities. Just as the media tried to scare Brits into not voting for Brexit, and are still lying to thwart Trump’s attempts to drain the swamp, the threats and beat down by Rajoy’s thugs could not stop the trend. CATALAN’S VOTED 90% FOR INDEPENDENCE! I hope the rest of Europe, as well as the people of Japan and the US are paying close attention, as Spain is hardly the only broke country that will try to impose their will instead of reforming. Everything is connected. Just as a failed little Austrian bank started the Great Depression, which was made worse by the fact that so much of the money sitting in northeast banks went to San Francisco to rebuild after the Great earthquake of 1906; today’s highly interconnected debt-based world economy certainly cannot withstand the collapse of a big bank in Japan, Italy, or Germany – all of which have banks on the verge of insolvency, and will be pushed over the cliff when the dollar and interest rates rise. Yes, the civil unrest in Europe, caused by failed govt policies, has capital seeking the safety of the US Dollar. Also, remember, it was just two years after the Great Depression that Hitler, Mao, and Roosevelt came to power. Broke govt’s around the world are being cornered by pension lies and exploding costs, like healthcare, that are the direct result of their own fraud and corruption. Instead of reforming for the benefit of the people, govt’s always lash out like a cornered wild animal, and try to confiscate more from the people so they can waste more. This trend of Socialism collapsing will continue for another 10-15 years, which means the private wave will continue, as capital exits risky govt bonds in favor of private assets. The big issue is what comes next, as we head back into another public wave. Will the Socialist system that entrusted too much power with bureaucrats turn into totalitarian regimes, or will we finally learn the lessons of history and enable Democracy to take that next big step forward for mankind? If you watched the pro-Marxist protesters in Madrid chanting fascist songs with their Hitler salute while demonstrating against the Catalan’s right to vote, we have a long way to go. There are huge numbers of people that work for the govt that will not go peacefully into the night. Examples of govt abuses and propaganda have been increasing for decades. Listen to the current propaganda around Trump’s tax plan, which is not aggressive enough to save our economy. Instead of an actual debate, which includes the fact that increasing taxes reduces economic activity in the same way liberals hope higher taxes will reduce cigarette smoking and the consumption of soft drinks, all we hear is we have to find a way to pay for the tax cuts. Meaning, we have no intention of actually reducing the size of govt by one penny. Therefore, you better figure out who else we can take the money from so we can keep the political donations flowing in order to maintain our perky lifestyle. For decades, Canada and other countries require that businesses prepay the tax on accounts receivable, whether they actually receive the money or not. Now, the Canadian govt wants you to prepay your taxes on contracts. So, if Bombardier wins a big contract to provide planes for the next 10 years, or a Toronto Blue Jays pitcher gets a lucrative 5 year deal, they have to prepay the taxes before they actually earn the money. Thank you, Canada, for the businesses and athletes that we will get from your self-serving idiotic policies. Hey, this should have been expected from a govt that thinks the solution to pollution is to lay off people so they don’t drive as much. The cumbersome VAT tax was not enough to support the unelected bureaucrats in Brussels. Now the EU wants to tax all social media and economic activity, specifically targeting American tech companies like Amazon and Google, which is certainly a sign that karma is real. After all, Amazon and Google are complicit with the CIA Shadow Govt and Deep State. Further proof that Google is part of the CIA that founded them is they blocked an App that showed the polling locations in Spain. Puerto Rico has been knocked back into a 3rd world country by a predictable hurricane because a fraudulent govt failed to do their job and provide adequate infrastructure. The complicit media never highlights the negligent and corrupt politicians that pocketed the money instead of properly managing assets under their control. Instead, all the media can do is use the crisis to relentlessly hammer the man that threatens their corrupt gambit. The same thing has been happening in this country, where govt wants to tax people more to rebuild assets under their control, that they surely know will depreciate. Private companies must always account for depreciating assets, or go out of business. Isn’t it about time we at least put career politicians out of business? The attitude of Collectivists, like Trudeau in Canada, Rajoy in Spain, Merkel in Germany, Macron in France; and Bernie and the rest of the establishment is that if govt could just collect more taxes, everything would be better. The reality is no amount of taxes is ever enough. The other reality is tax payers and freedom-loving citizens do have limits, and confiscating assets and abusing peaceful protestors will get many more people off the couch. If the police continue to follow the orders of their oppressive bosses, and are not prosecuted for abusing their citizens, things will get far worse than players protesting at football games. 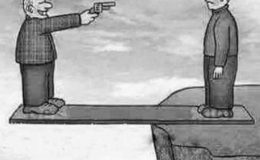 The political elite want to pit citizens against each other to keep the focus off of govt fraud, corruption, and abuses. What if the people wake up and realize the enemy is not their fellow citizen, but govt? The police are simply govt enforcers and revenue collectors. Pensioners will continue to see govt’s default on their promises, which are actually lies. This is a large group of people that will be pitted against tax payers, as if it’s their fault they believed the lies and don’t understand exponents. It’s a mathematical impossibility to pay out more than you bring in. It’s also impossible that citizens will stick around and be continuously fleeced. As IL and other socialist states are realizing, citizens will simply move. Capital can also move overseas and park off the grid, making it unavailable for growth or govt. Since govt’s never think the problem lies with them, they are always scheming for ways to postpone reality, and take advantage of crises. As we have been warning, the next coup attempt is to eliminate cash, so it can be tracked and confiscated at will. Casey’s article reflects where the govt wants to go. Bitcoin and other cashless mechanisms like Apple Pay are simply getting us comfortable with a cashless society, which the govt needs to track and confiscate every last penny from our pockets. Naïve people will see no harm with Fedcoin, just as they are clueless about the tax scheme called gloBull warming. The issue, of course , is the more the govt taxes, the worse the economy becomes. As Milton Friedman stated, “if you put the federal government in charge of the Sahara Desert, in 5 years there’d be a shortage of sand”.